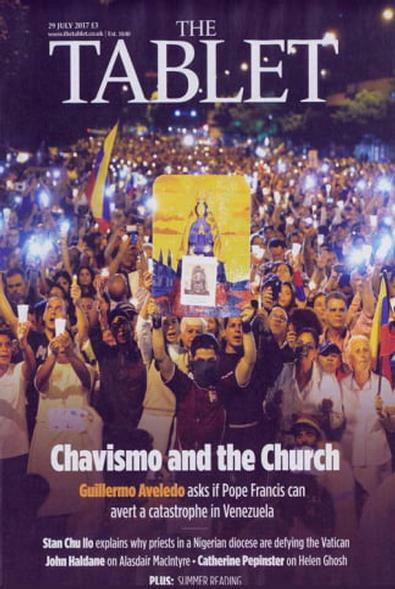 A subscription to The Tablet provides a British Catholic weekly newspaper on current affairs, politics, religion, social issues, literature and the arts. Founded in London, England, nearly 170 years ago, The Tablet newspaper has a long-standing international reputation unique in the English-speaking world. Each week The Tablet newspaper seeks to inform on religious affairs, politics, society, literature and the arts, considered in the light of Catholic principles and belief. In every issue of The Tablet newspaper you can read articles, by writers of international standing, which will help enrich and explore your faith; we discuss practical and spiritual issues within the parish in our 'Parish Practice' section, reflect on prayer in our 'Living Spirit' column and you will be uplifted by our window on the beauty of nature in our 'Glimpses of Eden'. Great reasons to buy a subscription The Tablet newspaper: - Never miss an issue - Free delivery to your door each week - Save off the cover price Subscribe to The Tablet newspaper today for you or a friend and celebrate the catholic religion. Please allow 10 - 12 weeks for the first delivery of this international title. The Tablet (UK) is a premier liberal journal of Catholic thought, with reviews of art,literature, media etc. It has been published for 175 years and is immensely influential. Well worth reading each week. Also good on-line archives.